Advocacy Day is a two-day event in Washington, D.C. where a passionate group of individuals unite on Capitol Hill to meet with members of Congress to urge them to make pancreatic cancer a national priority. These advocates travel from all 50 states and are comprised of survivors, caregivers, researchers, healthcare professionals, volunteers and loved ones of those impacted by this disease. Experience with talking to members of Congress is not required to attend Advocacy Day. We will provide you with the tools, resources and training to make your voice heard. Anyone who is passionate about telling their story and making a difference for pancreatic cancer patients is encouraged to attend the annual event! "I have met some of the greatest people in the world attending Advocacy Day. I have a network of friends including survivors, volunteers and staff which is second to none. It is a way to turn dealing with such a horrible disease into something extremely positive". The federal government is the largest source of research funding for pancreatic cancer research, accounting for approximately 80 percent. We need more research in the field to develop better treatment options and improve patient outcomes. Each year, your members of Congress determine how much funding will be allocated to cancer research. Meeting your elected officials and their staff in-person is the most impactful way to ensure Congress prioritizes funding lifesaving research for a disease with no early detection or effective treatment options. Advocacy Day is the opportunity for you to bring your story to Washington, D.C., to raise awareness about pancreatic cancer, to speak on behalf of those who could not, and to provide hope for those fighting the disease. Advocacy Day is an incredible bonding experience for those who choose to attend either by themselves or with their families, friends or colleagues. The more voices we can bring to the Capitol, the more powerful our message will be. You will hear from experts on the latest breakthroughs in scientific research for pancreatic cancer. Training will be provided to ensure you understand how congressional meetings work and to prepare you on how to talk to members of Congress. Activities during the day will include time for you to meet the people you will be attending Capitol Hill meetings with, so you can strategize about who will say what. It will also help you fine-tune your story into a powerful advocacy tool and teach you how to ask Congress what we need them to do: increase federal funding for cancer research. The most crucial part of the meetings is telling your personal story about how pancreatic cancer has impacted you. All congressional meeting schedules will be distributed at the end of the day. 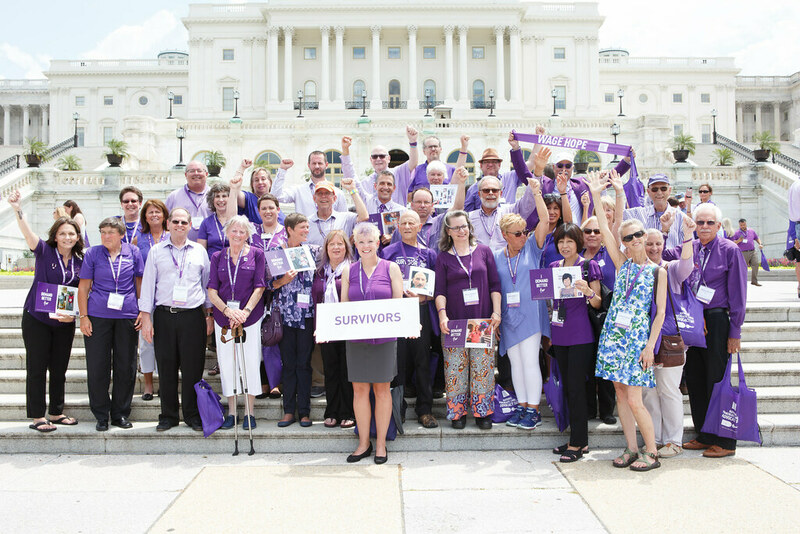 You will turn Capitol Hill purple with hundreds of fellow advocates and rally for pancreatic cancer research through meetings with your members of Congress. You will not be alone. We will arrange group meetings for you to sit down with your elected officials and/or their staff, and we will provide you with all the resources you need to be successful. Expect to attend meetings on Capitol Hill until at least 5 p.m. on Tuesday, June 25. We will set up appointments with your members of Congress for you ahead of time and distribute the schedules on Monday. Please do not contact members of Congress to set up meetings yourself. If you set up an appointment for yourself, you could prevent other constituents from getting an appointment, or create complications with meetings that we are scheduling for you.